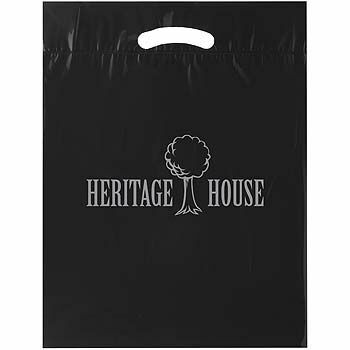 Imprinted Die Cut Handle Bags are one of the most economical and popular plastic bags in our line. It is made of heavy plastic film which makes it very sturdy. Call us for your custom order now! 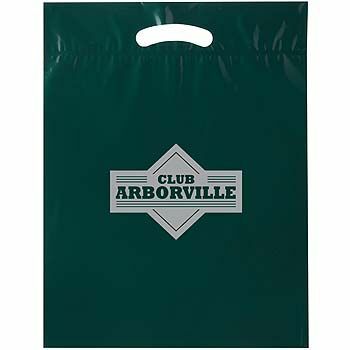 Now showing the options for "2.5 Mil" and "1 Color 1 Side - Flexograph Print"
15 X 19 + 3"
20 X 22 + 4"
Printed die cut bags are one of the most economical and popular plastic bags in our line. It is made of 2.5 mil plastic film which makes it very sturdy, and it has a fold-over reinforced die-cut handle for maximum strength. Pre-made blank die cut handle bags are hand fed into a press. 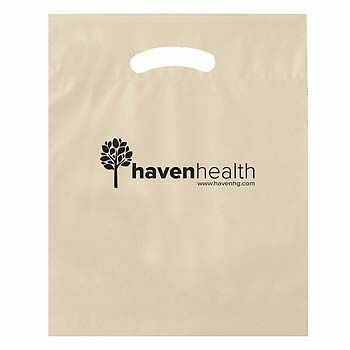 Where your logo or message is then overprinted onto the bag. 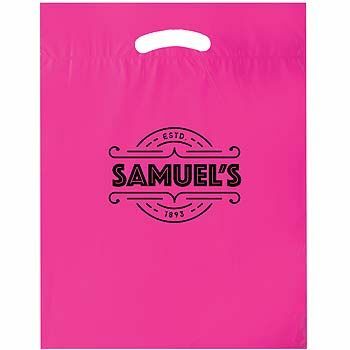 Bags in sizes 9x13, 12x15+2 are also available in one color printing only: Pink and White. 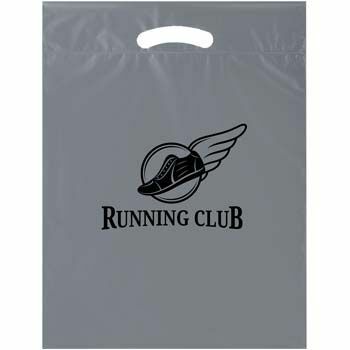 Black, Purple, Navy and Hunter bags can only be printed on with Metallic Silver, Gold, or Copper inks. 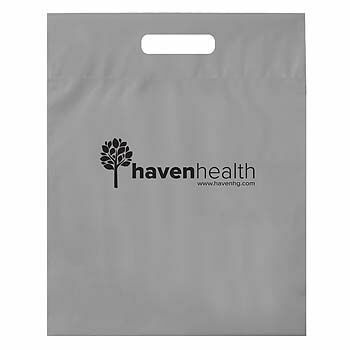 This bag is pre-made before printing is applied in order to provide small quantity orders starting at 250 units. 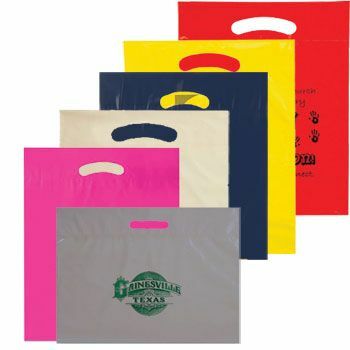 Since the imprinting is applied after the bag's construction, the best printing result is achieved with one color print. If your artwork includes two or more colors in close registration you will need to choose a standard run which start at a quantity of 5000 units. Choose bag ban compliant today. 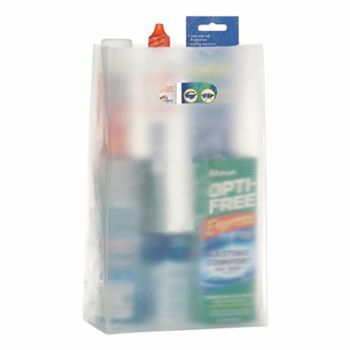 Meets California statewide law and local bag ban requirements! 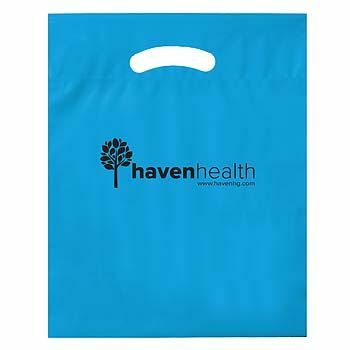 Try out economical custom printed bags custom die cut handle bags with single ply, 5000 bags min. Custom Sizes we can do. 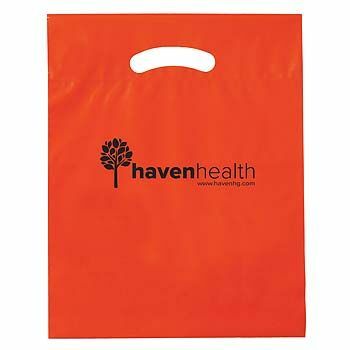 More bag colors avail and large imprint and full bleed also avail for our custom die cut handle bags. 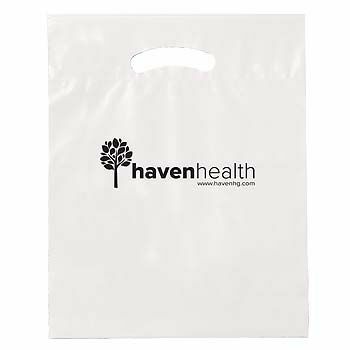 Biodegradable Die Cut Handle Bags! If you don't have the time or resources to create custom graphics, our stock designs offer beautiful quick-turn solutions. PMS Matching - $100 per color. Call to confirm color availability! We offer FREE Virtual Proofs. Whether you have your own design artwork, or need a solution from idea to finished product, Our skilled graphic design team can help put the finishing touches on your logo or artwork! We prefer VECTOR ART created in Adobe Illustrator (AI) or EPS format so we can manipulate the artwork and make spot color ready. (Vector format with fonts converted to outlines or curves). Important Note: JPEG, GIF, BMP, PCX, or other low-resolution raster images are not acceptable art for all imprints. If your only art is in one of these formats, there will be an art charge to recreate the art in an acceptable vector or high resolution format.